M&G, one of the financial clients I work on, have won more awards for their newspaper strategy and the M&G approach is now featured on the Newspaper Marketing Association website. In a depressed marketplace M&G Investments maximised their reduced advertising budget to increase response rate and pick up sales. National newspapers provided M&G with the ability to reach an affluent market sector cost effectively. The medium demonstrated its power to enhance brand perceptions through driving desirable image factors including the brand being 'informative', 'frank' and 'trusted'. The medium's ability to deliver in terms of strong response rates and sales is endorsed via the campaign winning gold at the IDM Awards. The financial market was facing hard times in 2001, following consecutive drops in sales - by the end of 2001 sales of ISAs (Individual Savings Accounts) had fallen by 30%. With declining consumer investment M&G faced a reduced marketing budget and increased sales targets. The core market was "mass affluents" - individuals with assets of £30,000 to £200,000 and/or incomes of £30,000 - £100,000. Just 8.4% of the population, but worth £500billion with their numbers expected to grow. Research showed that a large section of these "mass affluents" are under 40 years old quite whimsical and therefore tough to target. M&G identified a key segment - the over-45s "affluent silvers" - who spend much more time considering their investment options - and decided to focus on them. With a reduced budget M&G needed to spend their advertising pound more effectively. M&G's programme of quantitative and qualitatative research showed that consumers and IFAs (Independent Financial Advisors) alike expected five key strengths from an investment company, namely: expertise, informative, straight forward, integrity and durability. As a long established firm M&G felt comfortable about "integrity and durability" but needed to ensure their strengths in the other areas were communicated more effectively. Trust emerged as the key brand benefit to be communicated but it was not suitable as a proposition. The phrase "you can trust me" could evoke cynicism - the consumer would want to see proof of this claim. Consumers were looking for an institution that told the truth - one that gave the real facts and treated customers like adults. 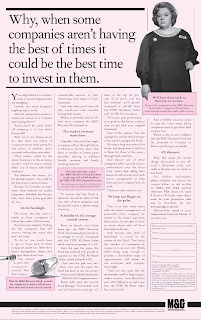 M&G's 'the truth about investing as we see it' brand response campaign ran as copy-rich newspaper ads. Each one explained a complex subject, such as ISAs or bonds, and demystified it. 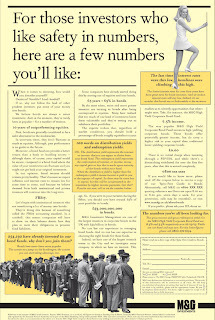 The ads ran in January 2003. To ensure greater standout the ads were featured in full-colour in the main news sections of national papers. Product ads followed, explaining specific M&G products and their performance and advantages. Placed in the newspaper financial sections this further targeted the audience in buying/considering mode. These ads ran in January, ahead of the 'usual' ISA advertising time of February before the turn of the financial year. This enhanced the message for readers to take their time and absorb the information.